All transactions are safe and secure with a reliable history in online purchasing behind each of our associates. Buy the Twittagra t-shirt to own Hot Tub Time Machine clothing and merchandise. When trying to figure out how to make money, Lou starts spouting off things that are successful, among them are Twitter and Viagra. He suddenly has the ingenious idea to create Twittagra despite not having a clue what Twitter is. 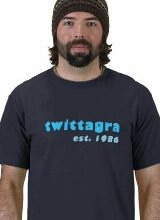 If you like his enthusiasm and absolutely ridiculous creativity, then nab this Twittagra t-shirt. If you think Lou is an idiot, check out the other Hot Tub Time Machine tees we feature like the Iron Maiden Killers tee, the Chernobly t-shirt, Sup Dawg and Kodiak Valley clothing. In addition to the Twittagra tee above, browse the Hot Tub Time Machine Clothing Gallery for more apparel like men's and women's clothes, kids shirts or hoodies.